Applications: Use on Finiteasy or other hand-held machines to reach difficult areas. Apply polishing compound. 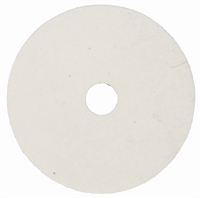 Product Notes: Finiteasy uses upto 150mm diameter discs with 25.4mm centre. Slower speeds will usually make it easier to achieve a better result. Standard hardness, H, is a firm disc for most tasks.